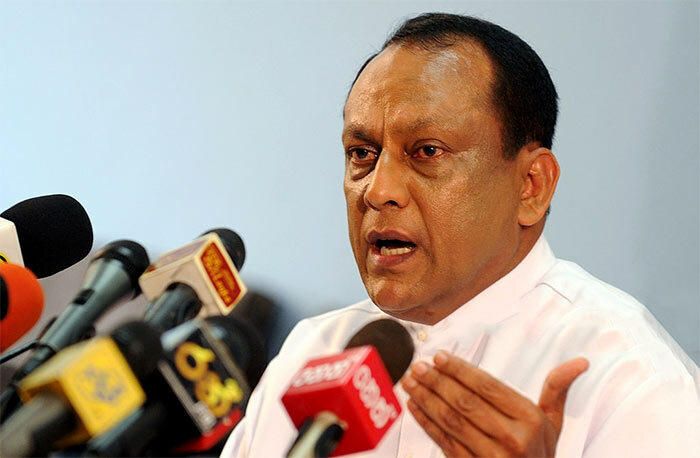 Minister Lakshman Yapa Abeywardena said the government was in the process of releasing a list of names of individuals of officials and politicians who have been implicated in the Bond scam. “Once this list comes out next week, many of these politicians who are crying foul over the Constitution will have to eat humble pie because of their connection to the Bond Scam,” he said. “It’s only a matter of time before this list is out in public,” he told a news conference at the SLPP party headquarters that SLPP members may continue to boycott parliamentary sittings due to legality of the proceedings, as there is a case before courts. He added that the party stance was to forge ahead for the elections rather than to drag the process by way of these parliamentary proceedings. MP Anura Priyadarshana Yapa said the public was aware of the fissures within the UNP because it was obvious that the party was having an internal crisis. MP Abeywardena said that there had been an issue pertaining to the pension rights of Samurdhi officers. “It was at this point that former Minister Basil Rajapaksa proposed the setting up of the Divi Neguma Fund, however the government changed and the Yahapalana regime took no notice of the concerns of these Samurdhi workers,” he said. “Within the first few weeks of this new government assuming office, we are thankful to Wimal Weerawansa for paving way for these workers to receive their rightful welfare benefits and monies,” he said. Why soon? Put the list out right now. Or are you waiting for a good deal. While waiting for this ‘List of Shame’, I wish to congratulate this Hon Minister for his truthful, honest, sincere and practical appraisal of the political situation. The UNP is ruled by a Dictator who is not willing to give the youth positions of leadership. The leadership is fostering future leadership on the basis of family connections and Samanelayas. Harin Fernando, Navin Dissanayake, Thalatha Autukorale, Sujeeva Senasighe have no place in leadership. The chosen Samanelays are Ruwan and Akila Viraj. SP is a crowd puller; he will be made use of and dumped. The UNP will be fractured before the next Constitutional Vote in Parliament; parts of the UNP will drift towards Our Great Leader, HE Pallewatte Gamralage Yapa Sirisena’s SLFP and others towards Basil R’s Pohottuwa. Hon MR’s Government will soon attract > 190 votes on the floor in Parliament. If the ‘Government’ lead by PM Mahinda Rajapaksa is ‘illegal’, the UNF ‘Opposition’ is illegal too. The only ‘legal’ positions are Opposition Leader Sampanth, TNA and JVP in opposition because those positions existed prior to the constitutional coup on Oct 26, 2018. Is a ‘NEW’ list being prepared?